Transparency Market Research delivers crucial insights on the PET bottles market in its published report, titled “PET Bottles Market: Global Industry Analysis, Size, Share, Growth, Trends and Forecast, 2018-2027”. 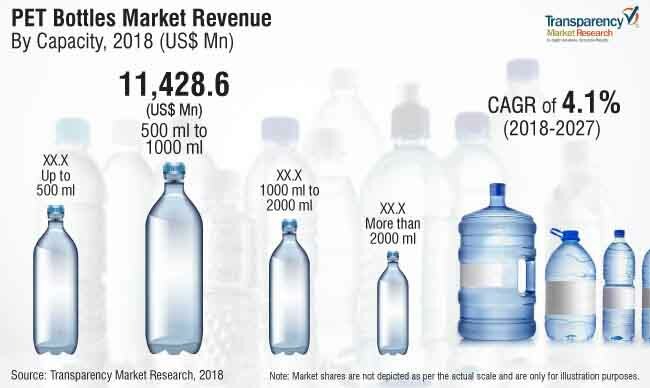 In terms of revenue, the global PET bottles market is projected to expand at a CAGR of 4.1% during the forecast period, owing to numerous factors, about which TMR offers thorough insights and forecasts in this report. Polyethylene terephthalate (PET) is a widely used plastic across the globe. PET bottles can be manufactured by two types of molding methods, namely - one step and two-step. PET bottles are highly consumed product in the packaging industry owing to the rising demand from food & beverages, personal care & cosmetics, pharmaceuticals, and other end-use sectors. PET bottles find useful applications in various end-use industries. PET bottles are available in various volumes from 100 ml and 200 ml to 2000 ml & above. PET bottles can be custom-made as per the requirement as well. In the report PET bottles market, TMR suggests that the increasing consumption of beverages such as, carbonated drinks, energy drinks, packaged bottled water, and others across the globe is supposed to be the key driver for the growth of the global PET bottles market. The 500 ml to 1000 ml PET bottles segment is expected to be the most lucrative type as per capacity. PET bottles within this capacity range are easy to use and can be carried comfortably. The 500 ml to 1000 ml capacity segment is expected to account for more than 50% of the total market share in 2018. In terms of neck type, alaska/bericap/obrist account for approximately 50.4% of the total PET bottles market by market value. The TMR study analyses the PET bottles market in several regions and focuses on the key dynamics affecting the market globally. There is a consistently high demand for PET bottles in the market due to their recyclability as compared to other materials. These factors are supposed to drive the growth of the global PET bottles market during the next decade. In terms of end-use industries, the beverages end-use segment is expected to drive the demand for PET bottles. The plastic ban implemented by several governments impede the growth of PET bottles. On the basis of consumption of PET bottles, packaged water segment is estimated to overtake the carbonated soft drinks market as the most consumed beverage type. The customers in the developing, as well as developed countries, are switching from carbonated drinks to energy drinks and juices. The volume sales of bottled water have grown at more than 10% in the past few years in the U.S., Germany, and Italy. The carbonated drinks segment has been witnessing a decline in sales for more than ten consecutive years, and beverage companies like PepsiCo, and Dr Pepper Snapple, are eyeing for the opportunities for PET bottles in water bottles segments. Apart from major beverage manufacturers, various local regional industries are engaging in bottled water segment. These factors are supposed to propel the demand for PET bottles during the next decade. APAC is expected to dominate the global PET bottles market throughout the forecast period owing to the rising consumption of carbonated and other drinks in the region. In the APAC region, countries such as, India and China, are witnessing a rapid rise in industries such as, cosmetics & personal care, beverages, food and others. These industries are premiere consumers of PET bottles across the globe. This factor is supposed to create immense opportunities for the growth of the global PET bottles market in the region. Recently, the state governments in several countries have banned the use of PET-based packaging products such as PET bottles to reduce plastic pollution. For instance, in February 2016, San Francisco became the first American city to ban the use of PET bottles of capacity 21 ounces or less in public spaces and those who violate the law could face fines of up to 1,000 USD. Such factors are supposed to hamper the growth of the global PET bottles market during the forecast period. Furthermore, PET bottles are highly customizable and can be manufactured as per customer requirements. The flexibility in the manufacturing of PET bottles is a major reason for the growth of PET bottles. The manufacturers operating in the global PET bottles market include RETAL Industries Ltd., Plastipak Holdings, Inc., Resilux NV, ALPLA Werke Alwin Lehner GmbH & Co KG, Esterform Packaging Limited, Koksan Pet Plastik, Taiwan Hon Chuan Enterprise Co., Ltd., PDG Plastiques S.A.S, Zhongfu Enterprise Co Ltd., Alpha Packaging, Eskapet Pet Ürünleri Kimya San. ve Tic. Ltd., Manjushree Technopack Limited Co., Mpact Limited, Indorama Ventures Public Co., Ltd., and Canyon Plastics Inc among other PET bottles manufacturers.